Newport's most fashionable address is a long, mostly straight street lined with palatial mansions, grand houses, and the occasional bungalow. Newport's Bellevue Avenue (map) is the city's main residential avenue and address for its famous mansions. It's a beautiful, tree-lined, mostly straight (if relatively narrow) 2.3-mile (3.7-km) boulevard that you simply must see when you visit Newport. The northern end of Bellevue Avenue is near the Hotel Viking, Redwood Library and Athenaeum, the Newport Art Museum, Touro Park (with its mysterious Stone Mill), the International Tennis Hall of Fame, and a commercial district featuring various shops. At the southern extent is Doris Duke's Rough Point estate, as well as the southern terminus of the Cliff Walk. There is virtually no parking along the Bellevue Avenue itself, and very limited parking on its few side streets, so driving along it is fine, but parking—especially in the busy summer season—is nearly impossible. Several of the mansions have on-site parking for visitors. Otherwise, the best way to visit the mansions is on mansion tours, or by bicycle, or, for the northerly mansions such as The Elms, on foot from Touro Park. 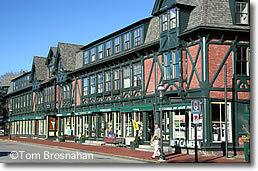 Half-timbered shops in the Travelers Block on Bellevue Avenue at Memorial Boulevard, Newport RI.